Ducati Designed by tattoo artist Grime, the one-of-a-kind Scrambler Ducati will be auctioned Saturday at the Mecum Las Vegas Motorcycle Auction with the proceeds going to Shriners Hospital for Children. The motorcycle originated as a Scrambler Ducati Icon, the first model of Ducati’s Scrambler brand, which is the company’s most successful model. It was artistically handcrafted through the forming of steel and aluminum to merge the world of motorcycling with that of tattooing, bringing together titans of separate industries for creative expression. Jason Chinnock, CEO of Ducati North America, will be in Las Vegas to present the full proceeds from the auction to the Shriners Hospital for Children. 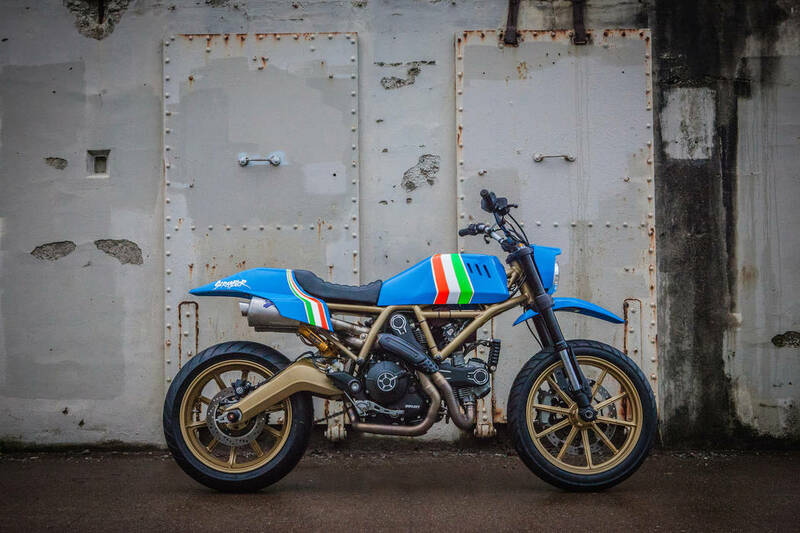 Grime’s design consists of a custom-fabricated gas tank, tail and headlight, with paint influenced by the Italian Football Federation’s colors and extensive rewiring by Ducati master technician Max Mueller. Additional modifications include fully adjustable fork cartridges, Ohlins rear shock with remote pre-load and adjustable compression, Custom 2-1-2 Termignoni High-Mount Exhaust, custom seat, rear taillight from a Ducati 996, dual throttle body conversion, dashboard and an oil cooler from a Ducati Hypermotard. Bids will be accepted Saturday at the auction, by telephone or online at https://bit.ly/2H4gLUr.